Natural cures for ovarian cysts aim to shrink the size of the cyst and correct the underlying hormonal imbalance that caused the body to form a cyst in the first place. A combinations of the proper diet, herbs and Bach Flower Remedies may reduce the incidence and shrink ovarian cysts. For most women, watchful waiting and using a natural cure for ovarian cysts works just fine. Again, unless your doctor says you're in immediate danger or you're experiencing pain, most medical authorities believe ovarian cysts are nothing to worry about and can go away on their own. However, do speak with your doctor about your medical condition, since everyone is unique. Herbalists use a variety of herbs to treat ovarian cysts. Since the belief is that an underlying hormonal imbalance creates conditions that lead to ovarian cysts, herbalists use a variety of plants to restore balance and harmony. Recommended herbs also include those that restore overall vitality and cleanse the liver. Herbal treatments won't cure ovarian cysts overnight. You must take the herbs prescribed by an herbalist for at least three weeks and preferably six weeks or more. The following list is intended as a general overview only. 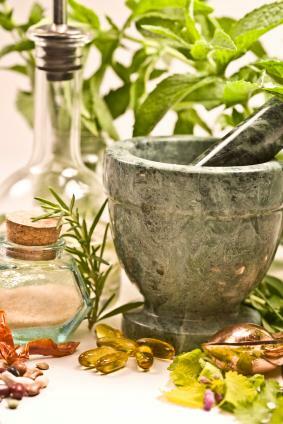 Please consult a naturopath or qualified herbalist for the exact herbs to treat your condition, and do tell your physician about any herbs you're taking. Chasteberry (Vitex agnus-casta): Herbalists have used vitex for centuries to restore hormonal balance. Because cysts may be caused by too much estrogen, vitex helps to bring estrogen levels back into balance, which could, in turn, help prevent cysts. Red clover: Red clover's estrogen-like effects make it a popular remedy for hormonal imbalances, and herbalists frequently use it to treat conditions like PCOS. The National Center for Complimentary and Alternative Medicine (NCCAM) is currently studying the efficacy of red clover. Black cohosh: Black cohosh is used by Ayurvedic practitioners in combination with red clover and other herbs to help balance hormones. It is thought to help restore irregular periods, which could be the cause of ovarian cysts. Dandelion: Dandelion is a diuretic that may help cleanse the liver. This in turn could help your body flush out excess hormones that may be causing the cysts. Wild yam: Wild yam contains chemicals that mimic or can be turned into hormones such as estrogen. If a hormonal imbalance is causing the cysts, applying a cream made from Wild Yams may help to correct the balance. Bee pollen: Bee pollen is used in supporting a woman's reproductive health. It may help to guard against some causes of ovarian cysts. Some preliminary research from Italy suggests that women who eat more meat and cheese products develop more ovarian cysts than women who do not eat these products. It may be wise to alter your diet, include more fruits and vegetables, or follow a vegetarian diet until the ovarian cysts shrink or dissolve. Other recommendations include diets rich in fruits, vegetables, garlic, legumes and whole grains. Eating less sugar and white flour also allows the body time to heal and rebalance itself. Herbal remedies for ovarian cysts may not work as quickly as pharmaceutical cures. Most herbs, like vitex, take at least three months to begin to balance your hormones. Hormonal balancing is just the first step in controlling ovarian cysts, so make sure you stay on the herbs long enough for them to have an affect. Keep in mind that it may be six months or longer before you see results. If you need more immediate relief, see your doctor about getting extra help while you balance your hormones for the long term. Usually ovarian cysts produce no symptoms and go away on their own. It is essential that if you experience any sudden, severe abdominal pain, bleeding, fever or chills, that you get emergency medical treatment immediately. While the majority of ovarian cysts aren't dangerous, these symptoms may indicate a ruptured cyst, which needs to be treated immediately by a physician. Common medical treatments for ovarian cysts include watchful waiting, hormonal pills to try to shrink the cysts or surgery. Most physicians are willing to cooperate with watchful waiting, in which the patient returns to the doctor for periodic examinations and scans to make sure the cysts hasn't grown or changed. Ovarian cysts may be the sign of another, underlying health condition. Treating the cysts naturally may help you to get the rest of your body back in balance as well. Try these natural remedies to help balance your hormones, prevent cysts from forming and lead a healthier and happier life.